After a long period of time battling addiction and going in and out of jail, my life was chaotic and going nowhere. After 12 jail sentences, I was offered a job and accommodation with a great organisation on release. But hundreds of miles away, I left friends, family, my home etc to begin a new life away from what led me to crime. Although I had changed my life and was on the right path I am extremely alone – spending almost all of my time alone. Cohort 4 entered my life and turned this around. With friendship, fun and being included, I was invited onto this amazing Landmark Trust trip as a reward for spending 12 months clean and out of jail. When we opened the front door and stepped inside ‘Howthwaite’ I felt transported into a different world. Splendour, grandeur and excitement. From the beautiful furniture to the details in the hanging pictures. The staircase and upper hallway are my favourite parts of ‘Howthwaite.’ I could imagine living here back in the 20thCentury. The whole house is amazing and has so many individual character pieces. 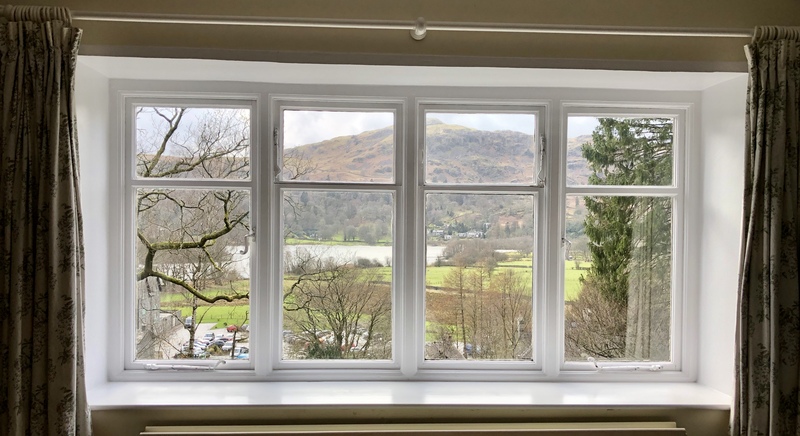 The free standing bath was a dream to bathe in plus the master double bedroom’s view – simply breath taking (I was given this main master bedroom – see the view from the window attached to this blog). 5 of the women members from our fantastic Cohort 4 came here for a weekend of relaxation and enjoyment. We forged strong friendships, learning about each other’s lives and struggles and the overwhelming strengths of each other’s overcoming factors. The house was the ideal setting for a weekend of enjoying each other’s company as well as the Lake District. The fresh air and enormity of relaxation has taught me personally to enjoy ‘simplicities’ i.e. reading, walking, admiring beautiful scenery. I struggle with relaxing – tending to keep busy. But being here, I have discovered that, ‘slowing down’ kicking back, relaxing is just as enjoyable! Problem is, I have got very used to doing very little reading, chatting etc – work Tuesday is going to be a struggle. This weekend has helped me to learn to relax and the factual knowledge I learnt about the surrounding visitor attractions has been most enlightening. Discovering various new facts, remembering childhood memories has been both emotional and enjoyable. Learning to entertain myself without the constant need for the TV!! I will most remember the fantastic scenery, beautiful landscapes I have only ever before seen pictured in a book or on TV. The time spent together in front of a roaring log fire, and friends. Oh, and the rain!! I feel grateful to the Landmark Trust. What outstanding kindness shown to groups such as ours, who would never have been fortunate enough to holiday here. The attention to details and upkeep of such amazing houses clearly shows the enormity of such an organisation. I would like to take this opportunity to say a huge thank you for allowing us to stay here in ‘Howthwaite’. Never would I be ever fortunate to stay and enjoy such an environment. To the donors making 50forFree possible, thank you, your donations allow opportunities for others to enjoy this amazing experience. I will hold this experience in my memory with such fondness.